Franck Muller 365 Port of Vanguard opens on Wednesday, 19 April at Haneda Airport, as a 365-day only store featuring the latest collection. The watchmaker Franck Muller has been devoting himself to the theme called “time” through watch production since the brand’s founding in 1992, and has been providing surprise and joy to the world with his original ideas and sophisticated technical capabilities. In recent times, he has been taking on new challenges for making precious moments immortal, by creating “Franck Muller Future Form”, which reflects his enriching view of the world of time. As the Franck Muller brand celebrates its 25th anniversary this year, it has produced a space themed on its iconic futuristic watch “Vanguard”. A limited-time-only café called “Franck Muller 365 Port of Vanguard” which embodies Franck Muller’s identity will open on Wednesday, 19 April, in an “airport” which serves as a gateway to the wider world. Franck Muller’s wish is to create a space where everyone could relax in. “Franck Muller 365 Port of Vanguard” is a casual café where people can use to take a little break and is also a lounge where people can relax and enjoy a little bit of me-time. The simple interior decorated with numbers, the tableware inspired by Vanguard’s elegant lines and form, and the intimate space with only 18 seats are sure to make us ponder upon on the journey ahead. So that such contentment would continue beyond the airport and throughout the journey, customers can take away Franck Muller’s original pastry, which is exclusive to Franck Muller 365 Port of Vanguard. The menu is themed on a collaboration between Franck Muller and “Japanese-taste”, which he has enjoyed for many years. There are two items on offer: “Daiginjo Chocolat” and “Black Bean Pound Cake”. 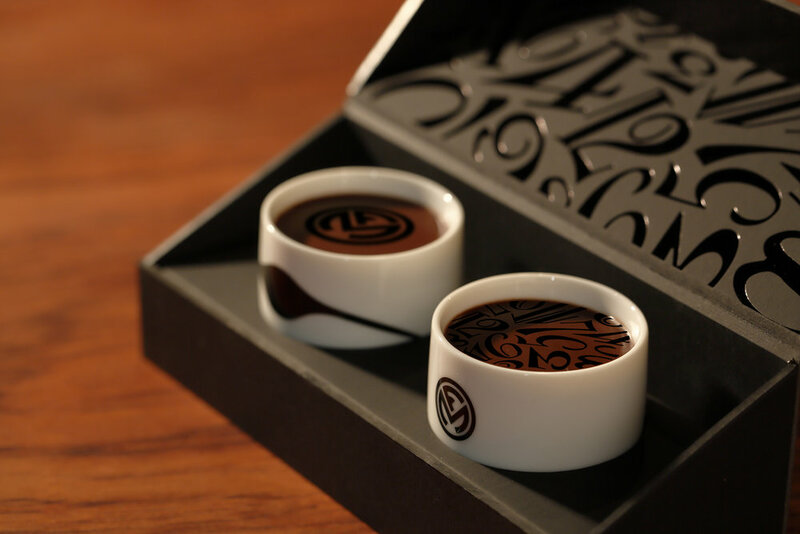 The “Daiginjo Chocolat” made with “Yamadanishiki” sake from a brewery in Miyagi with over 200 years of history, uses Belgian couverture chocolate as a base and is served in Franck Muller’s original sake cup. Its very mellow and rounded richness is made possible by using a few sake lees as a secret ingredient, in addition to Daiginjo, and its rich aroma and flavour are sure to tantalise the five senses. The “Black Bean Pound Cake”made with cultured butter and fresh Benibana eggs is a cake made with a Tamba variety of black beans that Japan is also proud of. The carefully selected salt that serves as a secret ingredient accentuates the mellow sweetness of the black beans, making the cake truly rich in flavour. The café also will be selling originally designed toys which adults can also enjoy such as kendama (limited availability), soft Kashwére blankets from Franck Muller Future Form, and tableware designed with the iconic and playful Byzantine numerals. These are also ideas that came about from Franck Muller’s wish for everyone to enjoy a happy journey with loved ones and families. The wall inside café is painted by Yoshi Sislay, Japanese artist based in Barcelona. He has created the hand-writing art with his unique feeling and experience, inspired by Franck Muller’s philosophy. A journey to Franck Muller is not just about travelling through space but is a time that makes one excited about a new beginning and for making irreplaceable memories. Franck Muller continues to add colour to an eternal journey, from the past to today and to the future, with his refined sense of “time” as a theme.